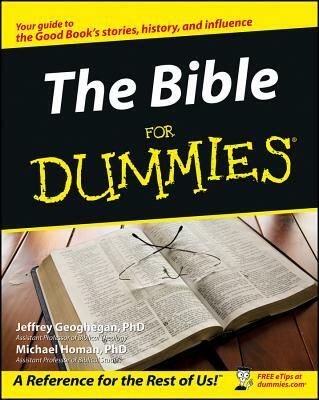 The Bible For Dummies (9780764552960) is now being published as The Bible For Dummies (9781119293507). While this version features an older Dummies cover and design, the content is the same as the new release and should not be considered a different product. Ninety percent of Americans own a copy of the Bible, and while it's the most widely read book, it's also the least understood. Regardless of your religion, understanding the Bible brings much of Western art, literature, and public discourse into greater focus--from Leonardo da Vinci's "Last Supper" painting to the Wachowski brothers' The Matrix movies. People have historically turned to religion to deal with tragedy and change, and with the right insight, the Bible can be an accessible, helpful guide to life's big questions. How is the Bible put together? Discover the world's all-time bestseller in an entirely new light. Whether you're interested in broadening your spiritual horizons, uncovering the symbolism of Western culture, or gaining a deeper understanding of the book you grew up reading, The Bible For Dummies has all the information you need to navigate this ancient and fascinating book. Jeffrey Geoghegan, PhD and Michael Homan, PhD have authored and coauthored numerous books and articles about the Bible.